As long-time readers know, I have been primarily bullish on equities since November 2012 -- but for the first time since then, I truly have no desire to "buy the dip" for anything longer than a short-term trade. 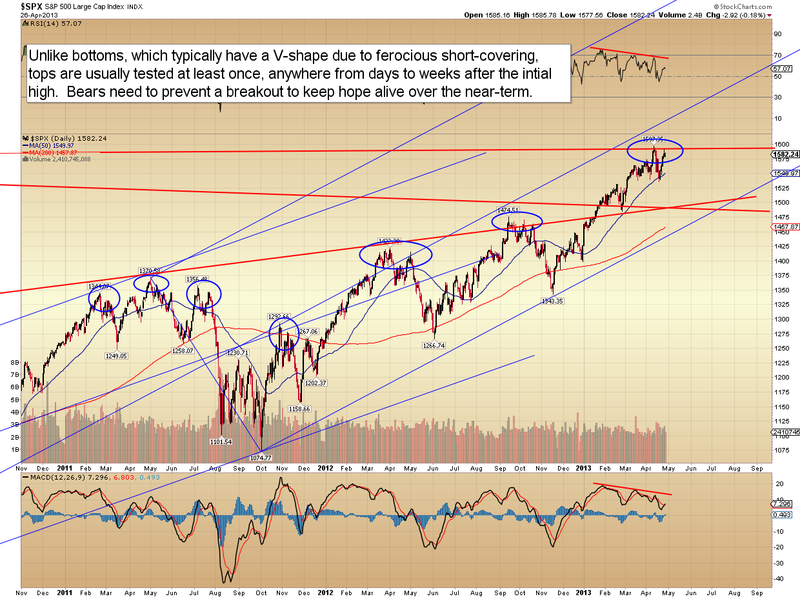 There are some disturbing early warning signs that the market may be undergoing a fundamental change of character. I don't presently know how long this will last, but when I see signals like this from the market, I don't screw around and risk gambling away my financial future. 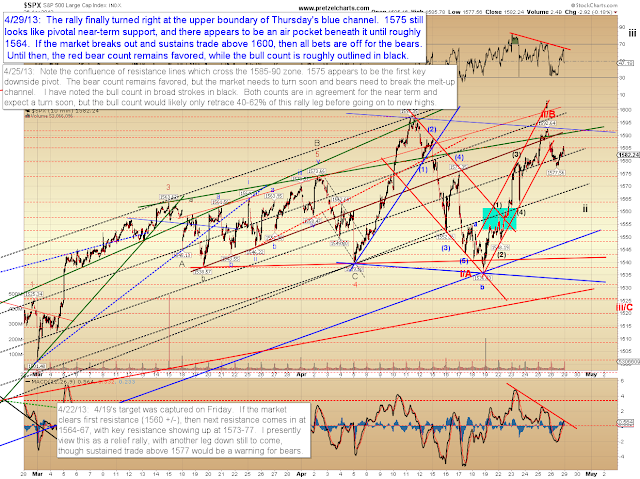 On the chart I published within that article, I projected a rally to the 1570 zone, followed by a decline toward 1540, followed by a rally to 1580 -- all of which have since happened. If we ignore the (correct) projection for that roundtrip lower and only look at the "top call" of April 16, basis the 1570 projection of that same day, then the S&P 500 (SPX) is now up almost an additional 13 points. To go back even farther, I was exceedingly bullish from the very first trading day of the year (see: SPX and US Dollar: Rally Likely Only Halfway Through) and continued outlining the bull case for several weeks after. I stayed unequivocally bullish until my adjusted target zone of 1520-1530 was reached, and since then, I've hit several of the turns with pretty darn good accuracy. If some readers are expecting more outta me than this, then I'd like to state, quite matter-of-factly, that I simply can't do much better. I'm quite sure somebody out there can, but this year overall has been about as good as it gets for me personally. So I would like to take this opportunity to lovingly remind less-experienced traders that there simply is no such thing as an infallible crystal ball in market projection. If one is expecting the impossible in terms of prediction, then one is certain to be disappointed. Make sure your trading goals are realistic and achievable, or you are doomed to an ever-shrinking account caused by repeatedly pushing your luck to the breaking point (also known as "overtrading"). Todd Harrison has a philosophy called "hit it and quit it," and I think that sums it up just about as succinctly as possible. Since April 16, I have been systematically outlining the bearish signals which have popped up, including things like overly bullish sentiment, and the smack-down in IBM on their earnings miss. These don't guarantee another leg down, but nothing guarantees anything in this business. The only thing we're ever "guaranteed" is an interesting ride. Well, that and a ludicrously Keynesian economic policy, of course. The rally feels like it will never end, which, ironically, is exactly how it should feel if it's going to end. Tops never look like tops until they're in the rearview mirror, otherwise nobody would have bought a single ounce of gold near $1900. 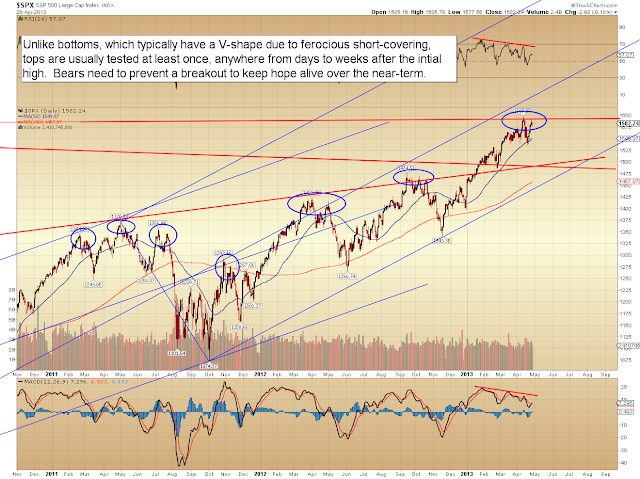 Note the daily chart of SPX below, and think back to how many of those tops "felt" like tops at the time. Incidentally, if you're an intermediate trader, there is almost never any need to front-run a top. While I will frequently front-run tops (and bottoms) in my analysis and projections, my philosophy as a trader is generally (not always, but usually) to wait until the market retraces at least 61% of the assumed first-leg down before going short -- again, this applies, for me, when looking at things from an intermediate basis or longer (short-term is another matter entirely). That approach not only seems to be in line with "the way tops work," but also helps minimize risk by providing a clear zone for stop-losses. I'll never understand the subscription services who tell their subscribers to front-run by selling into the teeth of a high-momentum rally (seemingly) every other week. I see no need to take on that level of unmitigated risk. As I mentioned last week, if the market breaks out convincingly over 1600, then we probably need to set our sights on the mid-to-high 1600's as the next target zone. 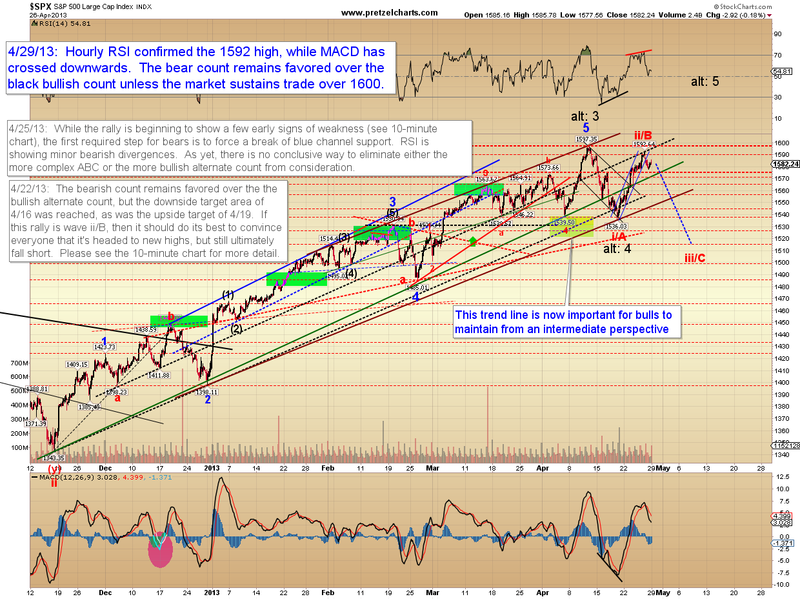 The rally has now exceeded my initial expectations, and the moment of truth has finally arrived. The 10-minute chart notes one of those amazing "coincidences," when the market turned perfectly at the upper boundary of the blue trend channel I drew for Thursday's update. Note the melt-up channel has finally broken. I feel reasonably confident publishing a bearish sell trigger with today's update, as shown on the chart below. 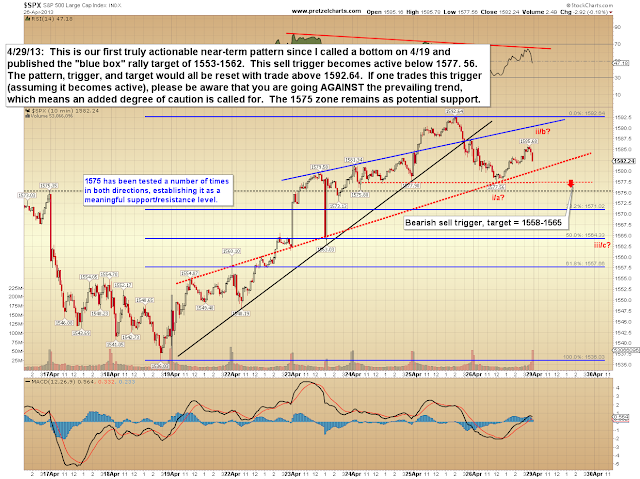 I would be a bit cautious about this trigger target if the SPX exceeds 1589 before turning back down, though. Although, to my way of thinking, 1589 would actually be a significantly better entry (with a tight stop) than "waiting" for the trigger to actually become active. As mentioned earlier, I'm a fan of buying and selling retests, because that allows me to more clearly define my risk. In conclusion, the rally has now exceeded my expectations and left a few question marks in its wake. If bears are going to get anything going, they need to make a final stand at these levels, otherwise, I'll probably need to dust off my recently-shelved bull horns. Trade safe. Reprinted by permission, Copyright 2013, Minyanville Media, Inc.
Deadeye, you are either reading every third paragraph, or this is too complicated for you. I think you may be spot-on...AGAIN...for a turn. But, there is nothing but air underneath the near-placed 'supports'. After that, a "Flash-Crash" is more than likely than not. No Fed rescue..."This Time"...!! I was suggested this web site by my cousin. I'm not sure whether this post is written by him as no one else know such detailed about my trouble. You're wonderful!